Pure launches Evoke D4 radio with Bluetooth streaming | What Hi-Fi? Radio giant Pure has today announced it has updated its Evoke range of DAB radios with the Evoke D4 and Evoke D4 with Bluetooth. Both units feature much improved audio capabilities, with Pure's audio engineering team hand-tuning each model. What will come as a pleasant surprise though is the addition of Bluetooth connectivity, which will allow streaming from compatible smartphones, tablets and other Bluetooth devices. Pure's iconic design is in evidence once more, building on the initial design of the Evoke-1, released more than ten years ago. Both Evoke models feature an intuitive new remote control, and a touch-sensitive Snoozehandle; which for those who like their sleep, makes it easy to snooze the alarm. Also onboard is an auxillary input for iPods, MP3 players and more. An optional rechargeable battery pack is also available, providing 50 hours of portable listening time. The radios have 30 built-in presets with four quick access buttons for sleep and kitchen timers, as well as tone and alarm functions. 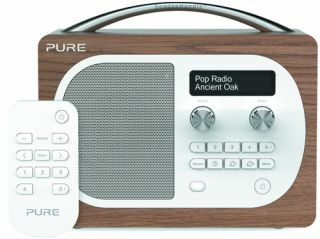 Pure's director of marketing Nick Hucker says of the refreshed range, "2013 is an important milestone for digital radio with the Government committed to making a positive decision on radio switchover by the end of this year." "As the company that pioneered the digital radio revolution with the original Evoke-1, which turned ten last year, we have an incredibly strong roadmap of digital radio products for the home and the car to suit the needs of all consumers as the category develops in the coming years and becomes more mainstream." The Evoke D4 is offered in real walnut or oak veneer casings, and is available now for £130. If the Bluetooth version takes your fancy, you'll have to wait until December when its released. It will come in sleek real wood 'domino' black, and 'glacier' white finishes. The Evoke D4 with Bluetooth will cost £150.